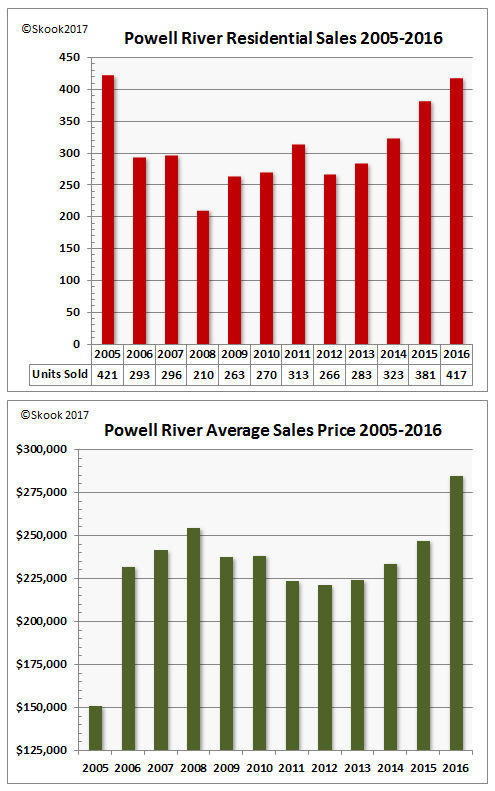 Let’s kick off Powell River real estate statistics with a historical look at sales and average sales price from 2005-2016. I mentioned in my PR introduction post that my sole source for data is the British Columbia Real Estate Association (BCREA) which pools the residential sales (single detached, duplex, townhouse, condo). However, as best as I can determine the sales are almost entirely single detached - please correct me if I am wrong. The sales data posted on the BCREA website starts at 2005 which was the peak year of the 2002-2007 BC coast real estate boom. Powell River property was dirt cheap (2005 Average Sales Price: $150,125) and a record 421 residences traded hands. Following the rules of supply and demand, as supply diminished sale prices rose with the average sales jumping +53.8% in 2006 ($231,606). The pattern is now repeating itself as the lower mainland real estate bubble impacts outlier market areas. Sales in Powell River gathered momentum in late 2013 and by 2016 reached 417 sales - a shade under that 2005 peak. Again, as supply diminished sales prices rose with the 2016 average sales price up +15.3% versus 2015 ($246,691) and +28.9% versus 2012 ($220,773). At the beginning of these booms, buyers are looking for value (best bang for the buck - especially important if the intent is to update and flip) so lower priced stock moves first. The next wave of buyers faces a higher price tier not only from “jacked” up prices (diminishing supply) but narrowing of choice in supply (to renovated flips and newer built homes). So, this narrowing of choice has a role to play in those rising average sales prices. The next Powell River post will take a more in depth look at the 2016 sales stats.